Tourists and investors are currently flooding Cuba. Since the new wave of trade and economic liberalization hit the island, foreign companies are keen on coming here to explore new business opportunities. What happens when the local organic farming collides with U.S. agribusinesses? Will Genetically Modified Organisms (GMOs) flood the island next? Cuba has been known as an oasis of small-scale organic and urban farming since the 90s. Urban gardens and small organic farms called “organoponics” emerged out of necessity and quickly gained international praise. It was a community response to the lack of food security after the collapse of Soviet Union. Yet despite the success, Cuba still paradoxically imports 70 to 80 per cent of its domestic food needs, according to the World Food Programme. As the new wave of economic and trade liberalization hits the shores of Cuba, many farmers are wondering how the local agricultural landscape will change. Agricultural and food companies from the U.S. are already actively visiting the island. They are coming based on the quest for new business opportunities, such as the export of Cuban organic products, as well as the production and import of their own goods, including the GMOs. What happens when the organic farming collides with the multinational agribusiness? Without doubt, Cuba stands today at the crossroads between upholding its internationally praised organic small-scale agriculture or promoting agribusiness and intense agricultural techniques. 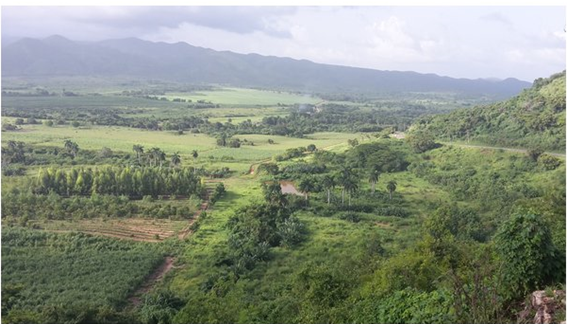 Before any GMOs flood Cuban fields and farms, the question of Cuba’s future, organic or not, needs to be resolved. The initial process of introducing GMOs on the island took place without any effective legislation or citizen participation. According to the report on Environmental Situation in Cuba, presented by People in Need (PIN) in collaboration with Cuban ecologists, Cuba does not possess any legislation that prohibits or controls the production, use or consumption of GMOs. Even though GMOs are already being imported and/or grown in Cuba, most people don’t know what GMOs are. According to the survey by Manuel Álvarez Gil, more than 73 per cent of Cubans could not explain what a genetically modified organism is. Such knowledge gaps exist in other countries as well. For example in Costa Rica a similar survey conducted by the University of Costa Rica and National University revealed that 75 per cent of Costa Ricans don’t know much about GMOs. How can this be possible when GMO-cultivation is reaching its 20-year milestone since being introduced on a global level? How can so many people, particularly in affected countries, still be confused about what GMOs are? As mentioned before, in Cuba and Costa Rica, some GMO-crops, which contain genetic material altered by genetic engineering, are already being produced. In Cuba, this includes Monsanto Roundup Ready maize, which has been modified to be tolerant to herbicide, cultivated for export and domestic use. Costa Rica produces certified and modified cotton and soybean seeds for export and it imports genetically modified corn, soybeans and processed food from the U.S. for local animal and human consumption. How many people in Costa Rica or Cuba are aware of GMO- cultivation? Despite the huge knowledge gaps, GMOs have continued to generate widespread controversy in agricultural circles. Worldwide, people have mobilized in protest against the increasing level of control that multinational corporations have over the global food supply. Nothing has been shaping the farmer’s world more intensively than the key question to be or not to be transgenic. Is the rise of the anti-GMO activism in Costa Rica an inspiration for Cuba? With the increasing production of transgenic crops worldwide, Marches against Monsanto have been organized annually to raise greater public awareness about the issue. 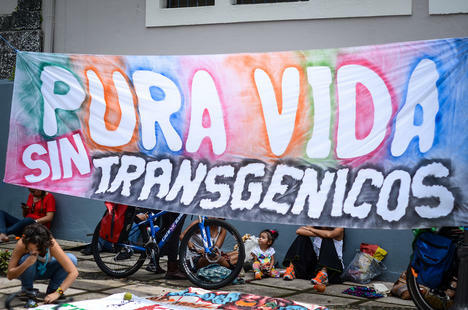 In recent years, Costa Ricans have also actively protested on a national scale with a one-week, 200-kilometer long march against GMOs from Guanacaste, the key agricultural province of Costa Rica, to the Ministry of Agriculture’s Headquarters in San Jose. Demonstrations and public opposition resulted in 90 per cent of the country’s cantons (local districts) and municipalities to declare themselves as “GMO-free.” Currently there are two proposals of law being discussed at the National Assembly which would place a moratorium on further GMO production nationwide. The proposals are stalled due to lack of interest shown in this subject by most of members of the Assembly. The biggest victory for the public and anti-GMO activists in Costa Rica came in 2014 when the Constitutional Chamber of the Supreme Court declared as unconstitutional the Article 132 of the Phytosanitary Law which establishes that “All technical and scientific information that is provided by natural and legal persons to the registers will have confidential character,” ( …) because it limits access to information of public interest and contradicts what is established in Article 21 of the Cartagena Protocol, violating Article 7 of the Constitution. For this reason it must be removed from the legal system.” The anti-GMO organizations and environmental groups were elated to show what individuals can do to change country’s political direction. Will GMOs flood the future? Most likely, Costa Rica and Cuba will continue to face pressure from multinational agribusinesses to liberalize their regulations and to open up hectares of land for GMO cultivation in the future. This is why there is such a vital need to close the knowledge gap on GMOs and encourage local activism. This may include advocating for GMO labelling laws which are currently non-existent in both countries or strengthening the approval process for granting GMO-cultivation as a human right to freedom of information. As witnessed in the land of Pura Vida, could the anti-GMO movement be an important source of inspiration for the rising activism in Cuba? Only by closing their knowledge gaps, can the people in Cuba, Costa Rica or elsewhere steer the policy debates regarding food and agricultural policy towards the future they want. Being informed and active is the best way to be prepared for the potential flood of GMOs.